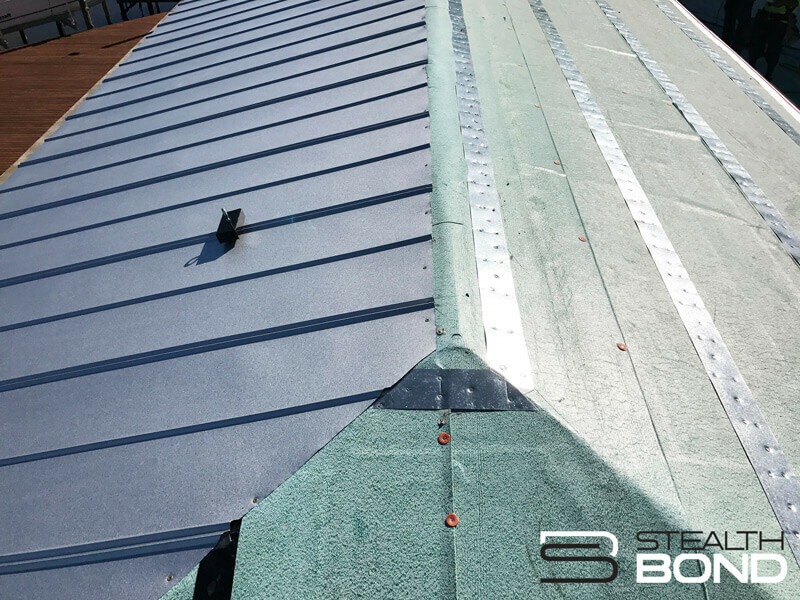 StealthBond® is an adhesive-based metal roofing installation system that’s easy to install and totally eliminates exposed fasteners that penetrate metal roofing panels. 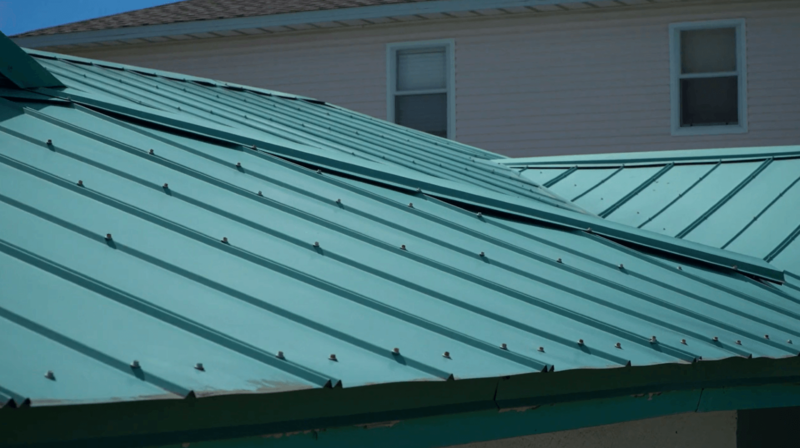 Traditional 5V Crimp and 3ft Ribbed metal roofing installations require thousands of screws to fasten the roofing panels to the decking, which means thousands of surface penetrations. Not only can screw fasteners cause unsightly oil-canning or dimpling, but they can back out of the metal panels, leaving your customers with holes and potential maintenance related issues. StealthBond® can also be installed over existing shingles with our StealthHat Metal Furring Strip. 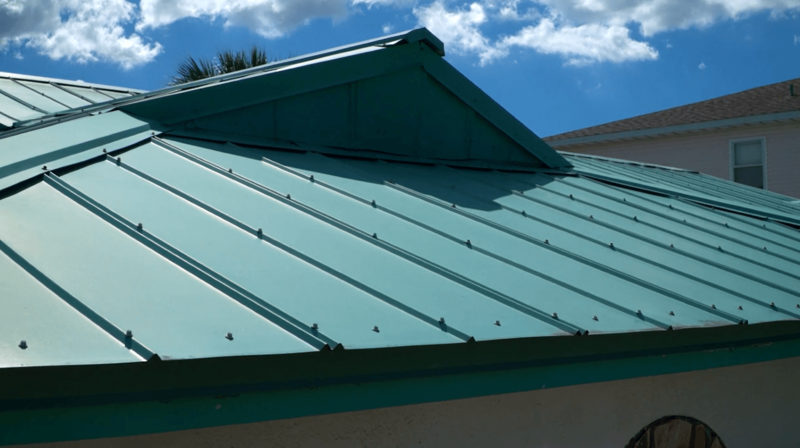 The StealthConnector®, a specially designed metal strapping, is laid across and then secured to the roof decking. Next, the StealthBond® Adhesive is applied to the StealthConnector®. 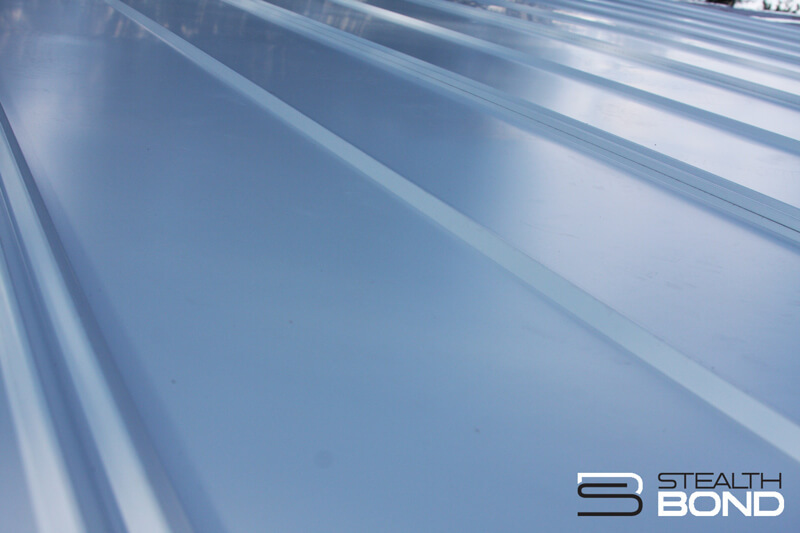 Finally, the StealthBond® Metal Roofing Panels are laid into the adhesive and adhere securely to the roof. The StealthBond® Adhesive provides more surface area bonding than a traditional screw installation. The adhesive provides a continuous bond across the entire width of the panel, as opposed to screws, which fasten at a single point. NEW! 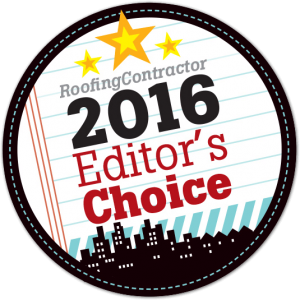 Check out our StealthHat Accessory for STEALTHBOND® Installations directly over shingles! The StealthBond® Concealed Adhesive System can now be used to install metal roofing directly over asphalt shingles using the StealthHat. Use our StealthHat Accessory to install metal roofing directly over shingles when using the StealthBond® System! Become a StealthBond® Dealer and have access to our specialized training program. All StealthBond® Dealers are carefully trained and authorized. Dealers receive on-site training to learn exactly how the system works, from unloading the components, to installing the StealthConnector®, to working with StealthBond® adhesive. We also provide marketing materials, selling sheets, exclusive access to our dealer intranet and more. Eliminates thousands of screw holes. Continuous bond across entire width of the panel. Structural adhesive allows panels to expand and contract. Minimized oil-canning and dimpling caused by screw tension. StealthBond® is backed by Gibraltar Industries. Time and labor-intensive pre-drilling extends installation period. Screws can back out of panels and washers may fail over time, requiring time-consuming maintenance. Metal shavings from screw-holes can corrode and stain panels. Higher risk of dimpling and oil canning from over-tightening fasteners. StealthBond® is backed by Gibraltar Industries and is proudly Made in America in Jacksonville, FL. Gibraltar Industries is a leading manufacturer and distributor of products for building markets. The company serves a large number of customers in a variety of industries throughout the world from facilities in the United States, Canada, China and Japan. What’s New On the Roof? 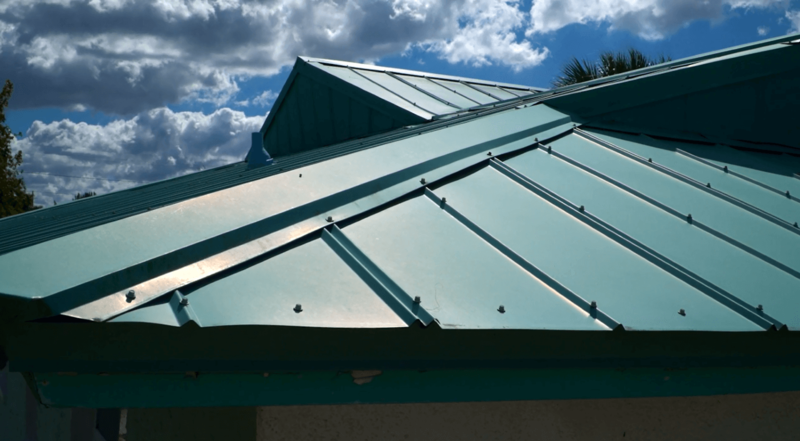 Discover the Latest Adhesive Innovations in Metal Roofing! Download Our Ebook Now. 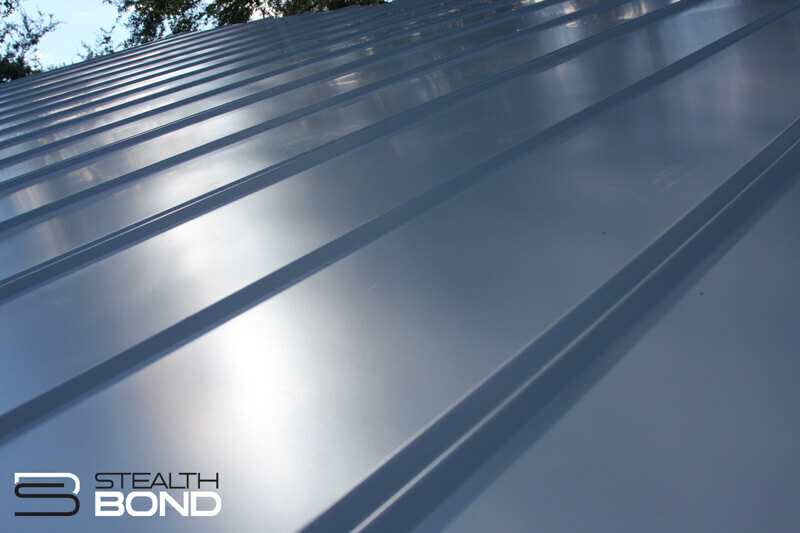 StealthBond® provides our authorized Dealers with the means to install both 5V Crimp and 3ft Ribbed metal roofing without all the screws.